New nurses hit the floor running and panicked, often wondering why they feel like they know NOTHING straight out of school. The reality is, grad nurses really don’t know it all. What a let-down for them, huh? How nursing will change you. My instructors failed to convey that becoming a nurse would change me in every way: nursing is not just a job because it becomes a part of our personality. That’s hard to explain to students. You have to live it. How to give a good report. Then there are the basics like giving report. No, I did not learn how to give a good report because I just “played SBAR” with my instructors and the nurses I was paired with on the floor. It was only as an RN that I learned how to give/take report, use a “brain” and communicate effectively with docs and other members of my team. It was not easy and I got a lot of grief when I gave a crappy report. The truth about nurses eating their young. Nursing school made me wary of experienced nurses and taught me that “nurses eat their young.” I was in no way prepared for the reality: Nurses don’t have time to eat their young. We have time for team work, excellent patient care, and a whole lotta charting. If other nurses can’t keep up, well, the ship is sailing without them. Time management. Charting efficiently, quickly and thoroughly enough and still getting out at the end of the shift was not a skill I learned in NS. That came later with time management–another hard-earned ability that can only be learned in time. Multitasking and prioritizing. These are also things that nurses learn to excel in OUTSIDE of the classroom. Multitasking is easy-peasy when you have one or two patients in clinical. Yet prioritizing is really critical for an RN who has 6 patients all going down the tubes at once. Healthy modes of stress management. I ate my way through nursing school as a means of coping and stress relief because frankly, we were being weeded out and the pressure was enormous. Eating a bag of Doritos relieved stress faster than going to the gym, okay? I admit it! But nurses can’t live that way after they graduate. 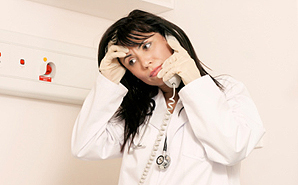 RNs learn to cope with stress in a healthy way or they get really sick, gain lots of weight, burn-out or worse. How to deal with death. Can you really be prepared for it? No, and it takes a lot of time to learn how to deal with death in a healthy, professional way. They just can’t teach you that in two years of clinicals. How to deal with feelings. Adrenaline is crazy, and there is nothing like being a new nurse and having to act under pressure in serious situations with adrenaline coursing through your veins. In nursing school, our hands would shake, we would laugh it off, make silly mistakes, etc. With practice, RNs act quickly in emergency situations without regard to their personal reactions — physical or emotional. How to deal with doctors. How to communicate with grouchy, mean doctors was not taught in pathophysiology, people! I was prepared for dealing with people on a professional level during daylight hours, who were not stressed out and in life & death situations. I was not ready to deal with docs who hate their jobs, never sleep, and frankly see me as the bane of their existence. Ok, I’m generalizing here, yet the truth remains: I had little contact with REAL docs and was blown out of the water by the working relationships I would form with them. Unexpected friendships. Lastly I was not prepared for the rich relationships and camaraderie I would form with the doctors and nurses I work with and the patients I care for. We nurses are in a business of people: good, bad, beautiful, ugly, functional, dysfunctional, alive and dead. People are our vocation as RNs and nothing is more rewarding than that! No, nursing school can’t teach students this stuff–we are LIFETIME learners. Nursing school gives us a very basic foundation of knowledge and we build, build, build on that knowledge from the ground up. The rule of thumb is that it takes most RNs about five years to even get somewhat comfortable in their specialty–and then they have to be really careful not to get cocky. The reality is that RNs see it all–but it takes an entire career to do so!